REAP ALL THE BENEFITS TODAY! With a high natural Collagen Hydrolyzed Protein content, this Beauty Hydration Drink may help in alleviating joint pain and protect your bone structure. Use it on a daily basis for stronger and healthier muscles, stiff-free articulations! Tired of investing your time and money in expensive beauty products that don’t deliver the advertised results? The Evoke Collagen-based drink is the perfect solution! This Beauty hydration drink contains 10g of Hydrolyzed Collagen per serving, an essential substance which will leave your skin and hair looking radiant and healthy. No more wrinkles, age spots or puffiness! Collagen Beauty Hydration Drink with Coconut flavor. *To see the Nutrition Facts, swipe left. Collagen Beauty Hydration Drink with Pineapple flavor. Collagen Beauty Hydration Drink with Mandarin flavor. Unlike similar products on the market, this natural Collagen Hydrolyzed Protein liquid has a delicious taste and is easily drinkable for everyone! 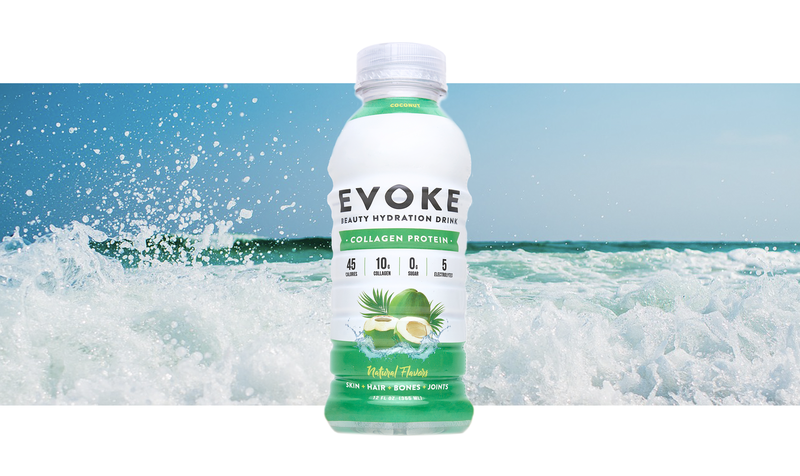 The Evoke collagen drink comes in 3 available flavors, including coconut, mandarin coconut and pineapple coconut! Questions or Comments about your order?